By my estimate, that must be the most oft-referenced naturalist quote, and the most famous of all the words spoken by the great man. Hopefully it serves as a conduit for people to read more of his work, as he was a very well-spoken polymath, and has as many wise things to say about our environment as he does the human conscience. I’m sure we’ve all experienced his mountain sentiment, and I can’t recall many times in life where it was so poignant than this past weekend. It’s been two weeks since returning from Patagonia and I’ve been in a funk. Not that I feel ill, or was melancholy, but both physically and psychologically things didn’t feel ‘right.’ At least one dawn patrol, some ice climbing and a couple of nights carving moon-shadowed corduroy were bringing things back to normalcy, but in general, the rebound from three straight weeks spent chasing a dream was not as easy, nor as quick as a simple flip of a switch. 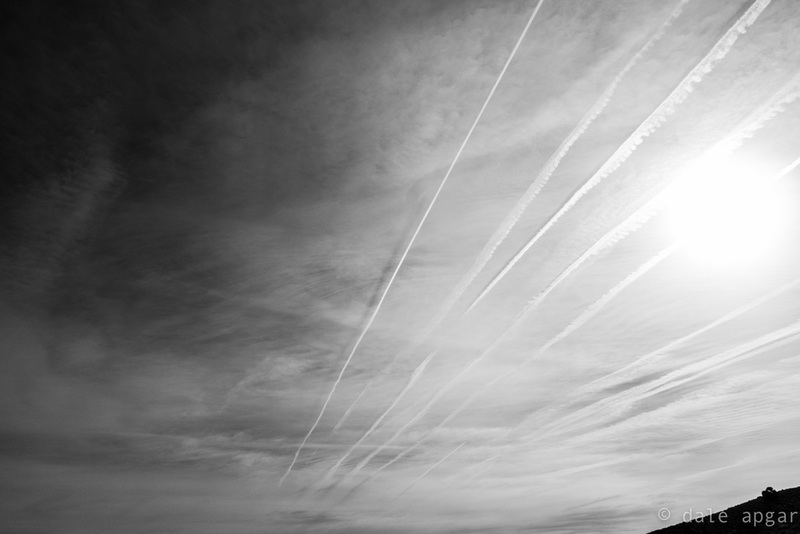 Throw in the unseasonable ‘winter’ weather gracing the Sierra, and something was happening – planets weren’t aligning, chi wasn’t centered, wavelengths had destructive interference…something. Every part of those two weeks were in familiar areas – places I’ve been many times before, people I know, views I’ve seen and activities I’ve done…If I try to self-diagnose after-the-fact, the exhilaration of exploring Patagonia for three weeks left a hangover and an addiction – the aftermath of seeing one of the world’s most beautiful and inspiring clusters of granite, glacier, lake, river and moraine leaves you looking at other locations with an inappropriate malaise, and a seemingly insatiable appetite to see and experience new things and places. Inappropriate because every time I return to the Range of Light, my face is sore from the perma-grin of seeing the spires, canyons and ridges that inspired Muir to pen his soliloquy. I’m biased, but I consider the Sierra a world-class destination and not to be filled with the typical boyish enthusiasm when touching down on the sage-rimmed, postcard-perfect tarmac was a foreign sensation. Addiction because the rush of seeing and experiencing new places containing new objectives and perspectives is unforgettable, and probably the closest I can hope of achieving enlightenment without practicing formal religion, putting a needle in my arm or a tab on my tongue. 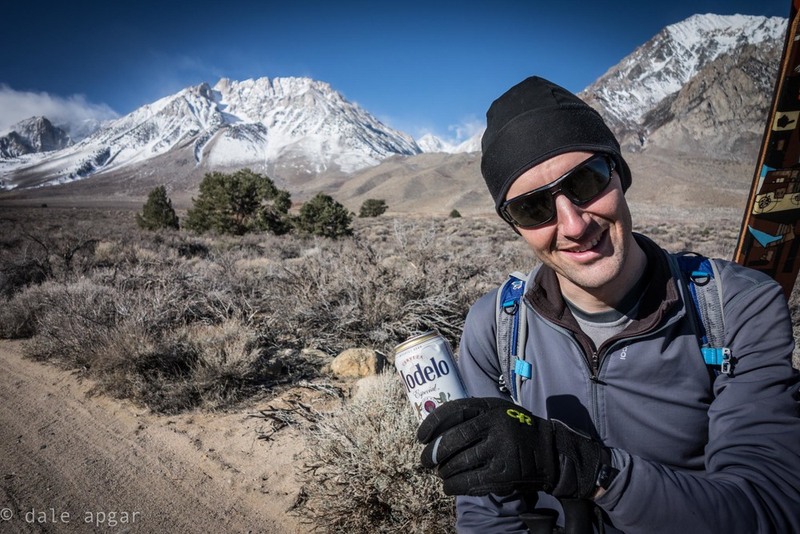 "Dale, if you're going to make me hike that much just to start skinning on unknown snow conditions, I'm taking one of your beers...imma gonna need it." Perhaps it was three weeks of being on foot – no bicycle, no car, and lots of vertical and horizontal ground covered. Typically, back in the States at least once a day I’m in a car, on a bike or – if I’m lucky – on skis with motion augmented by gravity or gasoline to accelerate the activity of getting somewhere. That could be for ‘business’ or pleasure, but regardless, it’s going faster and with more fun than simply being on two feet. Patagonia is exceptional in part because the access is still so primitive – with no gondolas, dirt bike trails, helicopter tours, zip lines or personal aircraft to expedite your exploring the magnificent massifs, lakes and glaciers making Chalten so special. You’re hiking…a lot, and it’s wonderful – it forces a pace to absorb the splendor around you, and appreciate the wonders slowly and methodically. 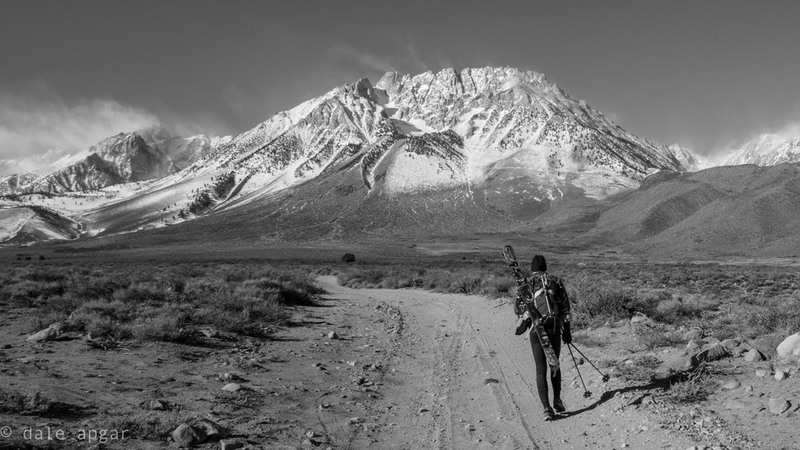 So, back in the Sierra, still in the calendar winter, but experiencing one of the driest seasons on record, what to do about this haunting desire to ski and explore? Throw caution to the wind, and make the most of the situation at hand. Patagonia also gave the lesson that ‘taking your gear for a walk’ isn’t always a bad thing, and sometimes additional effort than the ‘average approach’ in an ‘average season’ makes the earned pleasure an order of magnitude more fulfilling. 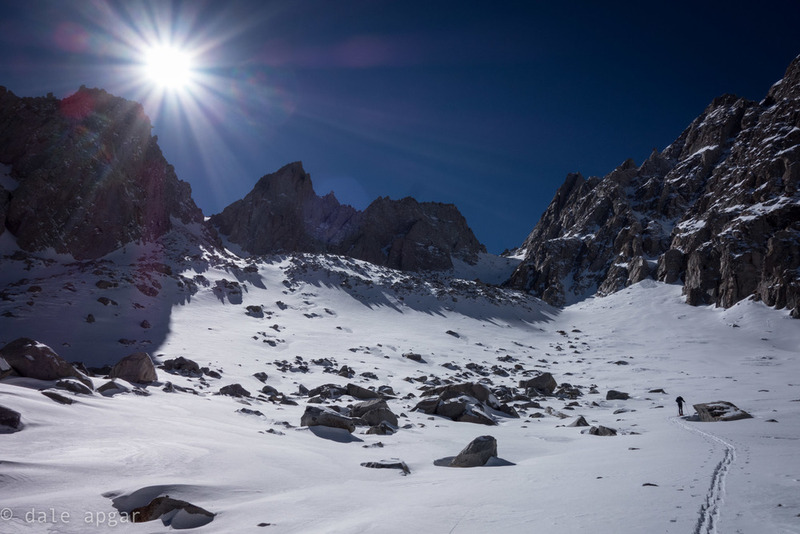 One of the things about the Sierra making its winter so special is how many of the skiing objectives are so tangibly close to the main thoroughfare – US395. Though the true distance can be soul-crushingly misleading, their seemingly straightforward, short distances amplify their devilish appeal and with a little extra fuel in the tank, those initial approaches can dissolve in melting pot of alpenglow and inspired conversation. Since my first drives up and down this most scenic of American scenic byways years ago, I repeatedly stare at Mount Gibbs’ east face and salivate at the thought of its scars filled with chalky, stable powder and tearing down them on skies impersonating Ted Ligety for 4k backcountry vertical feet. Basin Mountain has its own allure – it’s one of the big four dominating Bishop’s skyline, and has this unique feature lending its name: a basin at 11’ feet – a flat oasis of calm amidst the loud, merciless granite faces, spires and cracks making its east face more three-dimensional and vertical than it appears 7k feet below in the comforts of your leather-clad interior. But it’s 2014 – the winter of no snow. Not really, though, as the past two weekends storms graced the Sierra – not as large nor bountiful as years’ past, but still something. 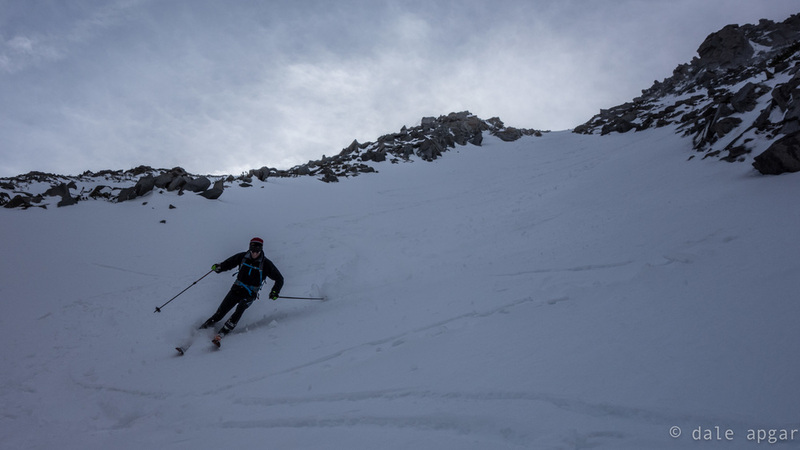 It didn’t matter to me if I had to hike a ways to find a salve to my ailment – two firm requirements percolating while planning for the weekend became resolute: ski, and explore somewhere new. Fortunately for me, Garth was on the same train, and he made sure we had adjacent seats for the two-day journey. So it was a stormy Saturday – on the way down 395, Gman passed an overturned semi and CalDot even closed the highway for a spell. With gusts reaching 100mph in places and spotty precipitation, catching up on life and a little R&R wasn’t a bad itinerary for the day. Winds were forecasted to die over the course of Sunday, and were lesser in the southerly regions so the itinerary became a double-up – Basin on Sunday, Gibbs Monday should the snow prove to be half-decent and the skiing not a lesson in sadomasochistic futility. I love winter..."...say, nice nut-huggers." “In a good year, you don’t hike basin at all,” a wise sage warned us Saturday night over beers and bluegrass. Yes, just three winters ago, skiing to your car in the Buttermilks from the top-out on Basin was a possibility, and the funny thing is, if you were to propose such an outing to me even one year ago, I would nod my head politely and experience thought bubbles akin to “Why would you want to do something like that?” Seasons and attitudes change, however, and after a late start, Garth was sipping a Modelo for second breakfast as we glanced forlornly at the miles of 4wd approach to Basin’s skiable acreage. With neither of us sporting vehicles of high clearance, we faced some road slogging to start the day, prompting Garth to crack a cerveza to the take the edge off. We quietly hoped the added effort would make our turns that much more salient while leaving the non-believers to tackle their bouldering problems over a vertical mile below. 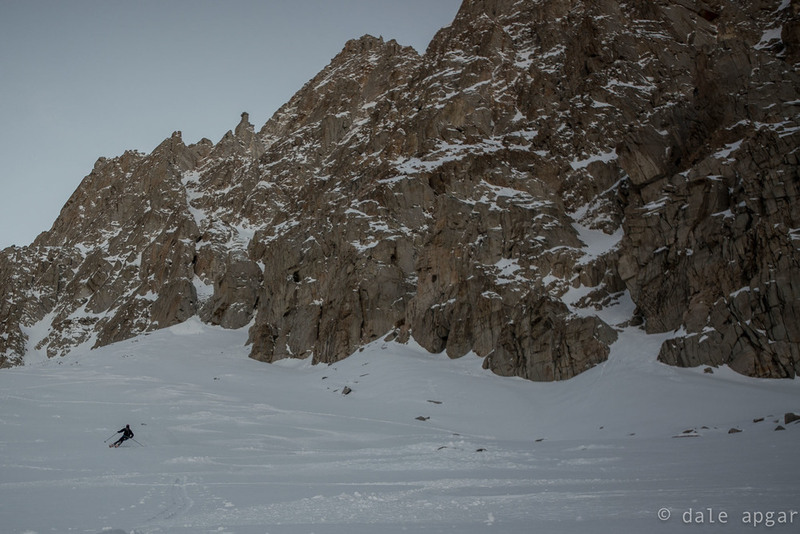 We made quick work of things, and within 2.5 hours skis were on and we were making skinning progress towards our objective, making sure to pack in calories and hydration along the way. The basin, even with its abandoned mining infrastructure was charming, and with each additional vertical foot gained, Gman and I were growing bigger smiles at the thought of skiing down – the conditions were surprisingly good – on both the quantity and quality scales. The late start and various breaks throughout the day all took their toll…by the time we topped out above the couloir, there wasn’t enough time to finish the scramble to the summit, but neither of us were despondent by not signing the register, especially since the descent was taunting us with its promise of a clean, aesthetic line full of unexpectedly good snow. The down did not disappoint…boot+ deep on a stable base [confirmed with an isolated column test with very good results] that saw far fewer scrapes to the ski bottoms than anticipated given what we saw from the car. Before we knew it we were looking at each other near the mine shaft aghast at our improbable fortunes: Is it possible to have so many great turns in the lowest of low snow years? 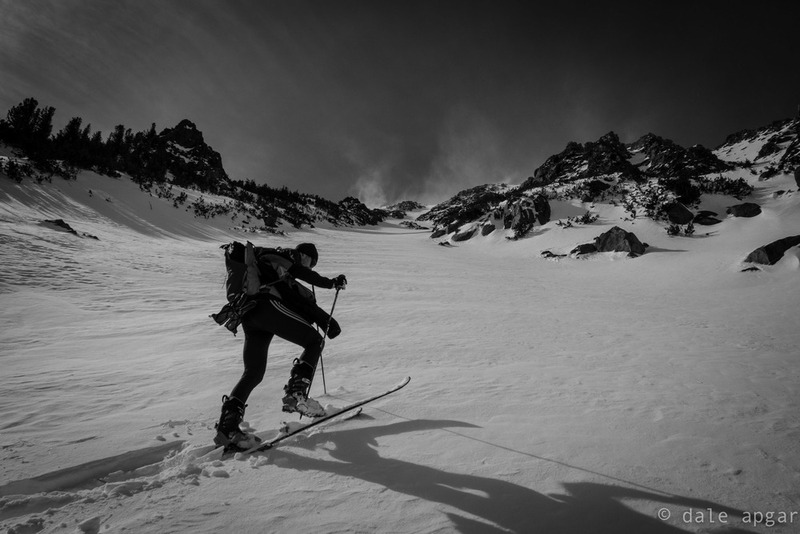 Our smiles and photos gave a rousing affirmative, so we hydrated, high-fived and skier-crossed our way down the switch-backed mining road to our stashed approach shoes. Hopping through the ungulate-strewn foothills and winding forest roads, we were sipping victory brews at the car in the Sierra twilight, both intoxicated by a day reaffirming the whys and how’s: why we live here, and how we recreate. For the cherry on top, a long-missed friend waited patiently for shared dining at one of Bishop’s finest, and we were joined by two more greats after a most serendipitous rendezvous acquiring the BYOB necessary for Airport Thai. Stories shared sipping our brews in the airport lobby, delicious cuisine devoured after a long day in the hills, and catching up with the people you criticize yourself for not spending more time with all made for a most fitting bookend. Which brings the other theme of the day back full circle: getting some time with such good people may require more effort, and is quite disparate, but when it comes, it’s that much more salient and rewarding. …How to follow that up on Presidents’ Day? 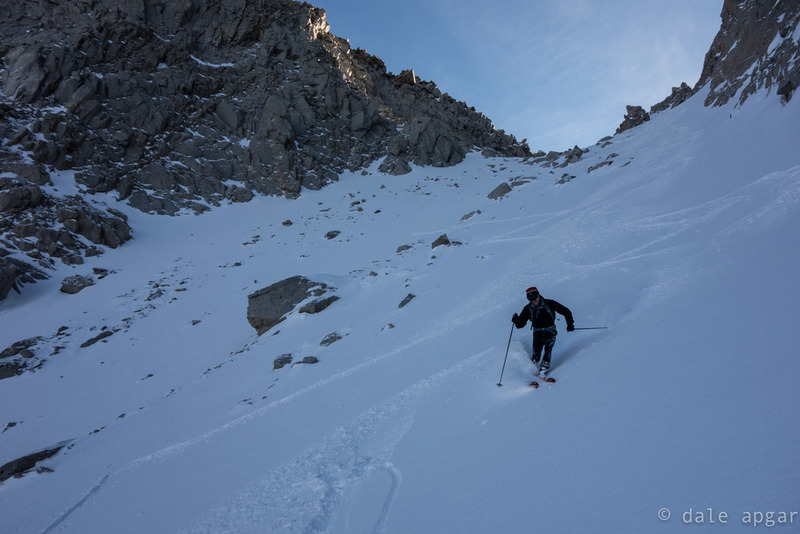 The snow was so good, Gman and I decided to continue with the original plan and gun for Gibbs’ east face chutes. A night on the town meant a late start again, but the rare people-watching opportunity of ‘LA-north’ on a holiday weekend, coupled with interesting characters and a confident, lucchese-clad bombshell, G and I couldn’t turn down some diversity to our weekend endeavors. The up just got better with each click of the altimeter: “Call me crazy, but I think this is going to be good...really good.” As we watched the spindrift billow off the summit and down the chute, wind slabs became the primary threat, this after the day turned ‘California bluebird’ and the blustery wind’s convective heat transfer kept temperatures civil for the snowpack underfoot. To mitigate this risk, we chose to ascend what we would descend, and dig pits for further information as necessary. 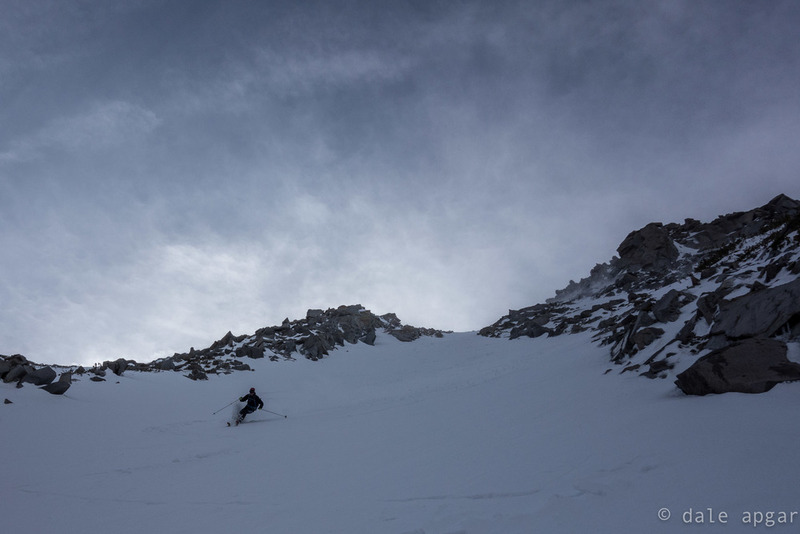 The elbowed-chute we chose was full of white, crystalline goodness – at one roll-over we dug an isolated column revealing what we saw throughout the 99 kick-turns on the way up: wind slabs were ubiquitous, but decently bonded and well-behaved. What we didn’t expect was the quantity: There was well over 400cm of mostly uniform density wind transport in parts of that chute, but compression tests revealed surprising stability, so we pressed upward. Topping out was as if I ascended with some of Patagonia still in my pocket, whereupon unzipping said pocket we were greeted with 30+ mph gusts carrying the facial exfoliate of last night’s snowfall. Rather than summiting the mountain, we opted to expedite the down, so cautious turns ensued…then it got steeper, more wide-open, and more fun. All told, there was 3500 vert of “punchy,” firm powder. My added heft over Gman and fatter skis made the conditions less like breakable crust and thus proves a case where being heavier is an advantage. 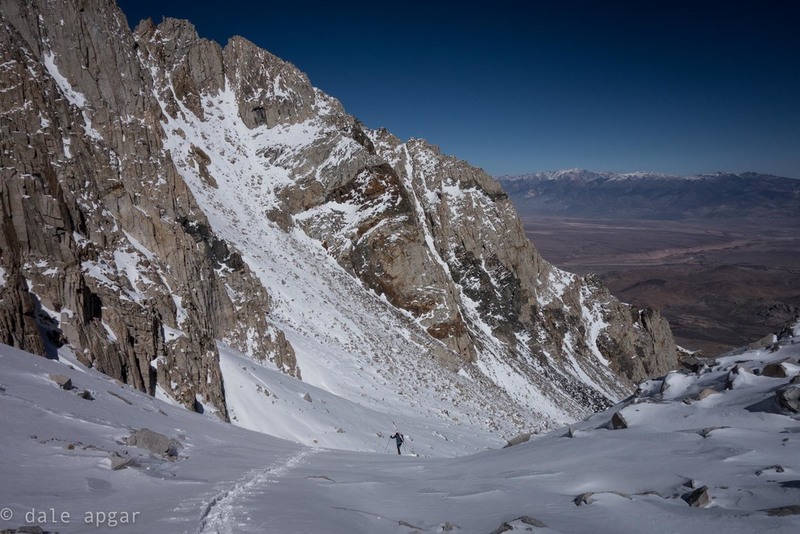 Going up, the thought was surface snow would ski like Basin one day prior: soft, chalky powder, but even while firm, Gibbs was still dreamy, and more than anyone could expect when looking just one mile away to the dry, parched high-desert devoid of white. 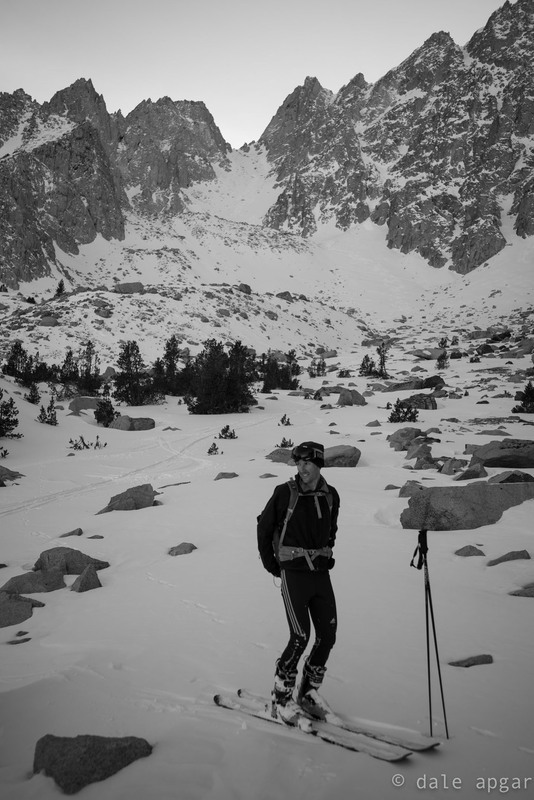 Skis shouldered, we avoided almost all of hatred shown by groves of gnarled Aspens we experienced by the author’s poor navigation on the way up, and we were sipping our beers talking about the finer things in life while watching the setting sun light up the last clouds hanging above the face we just descended. Unfortunately I can’t recall all the times in life where fulfillment was as memorable or sharp, but when they occur, they certainly seem unforgettable. Logging the last of the miles home after two straight days in new terrain on great conditions with superb company, Muir’s words echoed: The mountains called, and we went.